What had been dreaded has transpired; the elected Government, with the expiry of the sunset clause of the 21st Constitutional Amendment on January 07, 2017, has sought an extension in the term of the Military Courts for another two years. 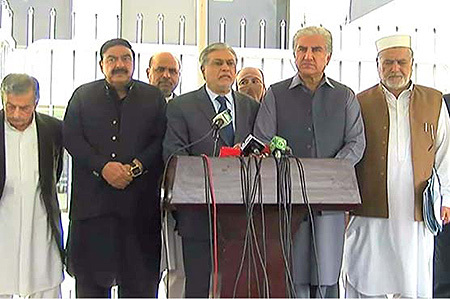 Major political parties have thrown their weight behind the proposal as well, including the JUI-F and the JI with the Pakistan Peoples Party, however, still hesitant on the matter. The formation of the Military Courts came about as an ‘extraordinary measure’ in the aftermath of the APS tragedy of December 16, 2014; packaged by Government as a somewhat bitter pill that had to be swallowed for a short while not only as a way to eradicate terrorism but as a stop-gap arrangement due to inefficiencies of the legal system, hence the two-year sunset clause allowing the Government and Parliament to bring in necessary reforms to strengthen the legal system to adequately and effectively manage challenges of terrorism. Reforms in the criminal justice system within two years were also a central tenet of the National Action Plan (NAP). However, without any progress on reforming the judicial system, the proposal to re-establish military courts is tantamount to Government failure. This highly contentious creation of a parallel system of justice was passed in the shape of 21st Constitutional Amendment by the current Parliament in January 2015. However, the Parliament, for its part, has also done precious little in the past two years on reviewing the performance of the Government on reforms in Pakistan’s criminal justice system. Although the Senate did a commendable job to produce a detailed report on the Provision of Inexpensive and Speedy Justice in the Country after detailed deliberations in its Committee of the Whole in December 2015, the Parliament on the whole did not exercise its oversight role in a befitting manner. Its Committees should have sought monthly reports from the Government on the steps taken to reform the justice system. Had the Parliament done its duty at that time, it would not be discussing again today whether or not to give two more years to the Government for the same purpose. Due to the failure of both the Government and the Parliament, it is indeed disappointing that we find ourselves at the same cross roads again, with the same arguments being floated. To add to the frustration, there are no real statistics or communication by the Government on the utility that Military Courts have extended in the fight against terrorism. This much is known that during their tenure, military courts tried 274 cases of terrorism and sentenced 161 terrorists to death, whereas another 116 were given varying jail terms, mostly life sentences. Out of the 161 sentenced to death, 12 have been executed till now. According to the numbers calculated by PILDAT based on media reports which may or may not be completely accurate, convictions of around 35 militants are pending before the Peshawar High Court.1 In addition, review petitions of at least 11 of the convicts of military courts against dismissal of their earlier appeals are also pending before the Supreme Court. Given that the Supreme Court and High Courts have carried out in-camera proceedings in this regard, it is difficult to verify the ground for the appeals. The matter must be strictly resolved within the Parliament and through its Committees, through detailed briefings by the Prime Minister Office, Ministry of Defence and Interior, and senior Military Officials, and not as has been done till now through Multi Party Conferences, or hasty meetings of Parliamentary leaders within the Speakers’ Chambers. Given that terrorism still haunts Pakistan, even after the two-year expiry of the Military Courts, reasons may be made clear why the extraordinary measure achieved only partial success. Given its inability in instituting reforms in the criminal justice system in the past two years, the Government may outline any proposals it has in this regard with concrete timeline, along with also stating why it was unable to bring these reforms in the first place during the past two years. Unlike in the past, the Parliament must also redeem itself and carry out an effective and regular oversight in this regard. Monitoring progress on criminal justice reforms should be the responsibility of the Parliamentary Committees on Law and Justice, and monitoring implementation of the National Action Plan should be that of the Parliamentary Committees on Interior. The most effective way to do so may be to combine the mental and financial resources through combining the Standing Committees of the Senate and the National Assembly for this purpose. The launch of Operation Radd-ul-Fassad on February 22, 2017 comes at the heels of Operation Zarb-e-Azb, launched during the tenure of former COAS, Gen. (Retd.) Raheel Sharif on June 15, 2014, which had the main aim of neutralizing the former militant stronghold of North Waziristan. Although the launching of Operation Radd-ul-Fassad might have been in the offing for some time, its apparent catalyst was a series of terrorist attacks that rocked all four provinces of Pakistan during the first two weeks of February 2017, culminating in the attack on the popular shrine of Shahbaz Qalandar at Sehwan on February 16, 2017. Unlike Operation Zarb-e-Azb, which was only restricted to North Waziristan, the theater of Operation Radd-ul-Fassad will be the whole country. It is important to note that the deployment of Rangers in a province had been construed to be an irritant for civil-military relations in Pakistan by various observers. 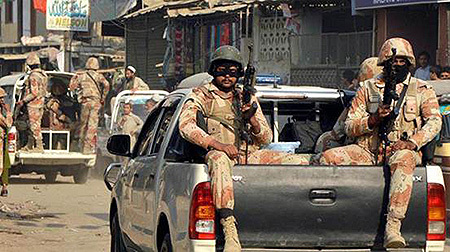 Regardless of whether there was any truth to this or not, opposition parties such as the PPP and PTI on numerous occasions have publically demanded deployment of Rangers in the province. Many procedural and constitutional precursors to the launch of Operation Radd-ul-Fassad remain opaque. For instance, the ISPR press release, which announced the launch of the Operation, does not make it clear at what forum the decision to launch the Operation was made. The Federal Cabinet’s last meeting was held on February 07, 2017, and launching an operation across the country certainly did not figure on its 33-point agenda.5 Neither was a meeting of the National Security Committee, the country’s ‘principal decision-making body on matters of national security’ convened. Maybe the decision was taken at one of the security huddles convened at the Prime Minister Office, which see inclusion of select members of the Cabinet and military leadership with the notable but ironic exclusion of the Federal Minister of Defence,. Notably, the announcement of the Operation came from the ISPR, which usually assumes responsibility for issuing press releases on security related measures, including launch of Operation Zarb-e-Azb, formation of Military Courts, formation of Provincial Apex Committees, etc. In addition, it was only when Pakistani media persons accompanying the Premier asked questions about the operation during his visit to Turkey that he clarified that the decision to launch the operation had been taken at a meeting held at Prime Minister House some days earlier. This creates the impression of a dearth of ownership on part of the civilian elected Government for such security related measures. This lack of ownership is also reflected on the part of the Parliament and Provincial Legislatures in their responsibilities to ask the right questions on targets and timelines of the operation as well as carrying out their due oversight role. For example, the Parliamentary Committees on Defence and Interior have hardly made any systematic effort with regards to developing oversight on progress of implementation of National Action Plan since it was formed. Lastly, questions also remain with regards to successful implementation of the National Action Plan, and how shared responsibility of the civil-military in relation to it will contribute to the success of the Operation. Currently, as per PILDAT’s research, oversight on implementation of NAP within the Government is being carried out by the Implementation and Review Committee under the leadership of the National Security Advisor, while data in relation to it is still being collated by NACTA. Resultantly, an impression is perpetuated that implementation and oversight of NAP is currently being done through ad-hoc measures, with no clear institutionalized mechanism in place. Although de-weaponization, explosive control, better border security management, counter-terrorism operations by Rangers in Punjab, are mentioned as some of the key features of Operation Radd-ul-Fassad, the eventual aims remain unclear. Without this clarity, Pakistan may seem destined to lurch from one military operation to the other without measuring the success of any of these. Gen. (Retd.) Raheel Sharif to lead Saudi-led Military Alliance? Pakistan had initially found itself in the crosshairs of Middle Eastern politics as Saudi Arabia named it as part of its newly formed military alliance of Muslim countries meant to combat terrorism, apparently without first getting Pakistan’s consent. However, after initial ambiguity, the Government had confirmed its participation in the alliance, but had said that the scope of its participation would be defined after the Kingdom shared the details of the coalition it was assembling. As media commentaries gained speed, criticizing the former COAS for becoming a part of an Alliance that may not have unanimous support of all the Muslim countries, especially Iran, and the precarious position this would place Pakistan in, the elected Government seemed to retract the publically stated position. For example, only two days later on January 08, 2017, the Prime Minister’s spokesperson, Mr. Mussadiq Malik, stated that no official proposal had been shared with the elected Government in this regard.